Standard springs are not designed to do a heavy-duty job! Every summer, thousands of holidaymakers hook up their caravans and take to the open road in search of a good time, only to experience adverse vehicle handling during their journey. Typically a caravan connected to a fully-loaded car will cause the rear of the vehicle to sit noticeably lower than the front. This ‘sitting down' effect puts extra stress on the rear springs, resulting in sag (long-term shortening) and increasing the risk of breakage. Because the rear springs have been severely overloaded, they are unable to return the vehicle to its original ride height, causing vehicle handling to be adversely affected. To compensate for the additional load and to reduce the ‘sitting down' effect, Lesjöfors have designed a range of heavy-duty coil springs (15-30% stronger than standard springs) which are able to support a heavier load without compromising vehicle handling. 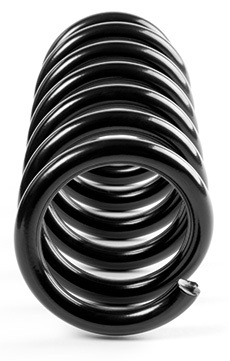 These springs have a progressive spring rate, with resistance increasing as the load increases, allowing them to be used when the vehicle is unloaded with no discernible change in ride comfort. Lesjöfors' heavy-duty springs work with standard shock absorbers; so further suspension upgrades are not required, and most heavy-duty springs are slightly shorter than standard springs to ensure the car does not sit too high when unloaded.